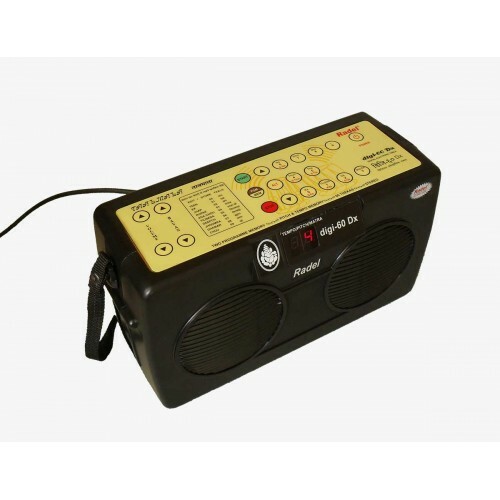 Taalmala Digi-60 Dx Electronic tabla , available in taalmusicals.com vijayawada. The Taalmala Digi-60 Dx Electronic tabla Stereo is a state-of-the-art digital musical instrument that has been designed by the pioneers in Indian electronic musical instruments. This instrument uses the latest sampler technology to produce natural tabla sound along with sophisticated features unmatched by any other model of electronic tabla. Crystal clear, natural Stereo sound is provided for the separation of the tabla (right hand) and the dagga (left hand). There are 60 thekas in various taals that can be played at any tempo. Many varieties of common taals have been provided, including some authentic traditional thekas. 10 of these can be modified by the user and stored in memory. A multi-functional digital display for indicating taal number, matra number, pitch and tempo. Digital tuning of pitch with facility for fine tuning within half notes. 4 ranges of tempo – from ati-vilambit to drut are provided. The tempo can be gradually increased from ati-vilambit to ati-drut without stopping the theka. Two settings for bayan (dagga or left hand sound) – with a deep ‘gumki’ or a shallow ‘gumki’. Memory for storing the fine tuned pitch, tempo and bayan setting. Two user programmable thekas that can be stored in memory.